In addition to the default sport modes stored in the watch, you can create and edit custom sport modes in Movescount. A custom sport mode can contain 1 to 8 different sport mode displays. You can choose which data appears on each display from a comprehensive list. You can customize, for example, sports-specific heart rate limits, autolap distance, or the recording rate to optimize accuracy and battery duration. Any sport mode with GPS activated can also use the Quick Navigation option. By default, this option is off. When you select POI or Route, you get a pop-up list of the POIs or routes you have defined in your watch at the start of your exercise. 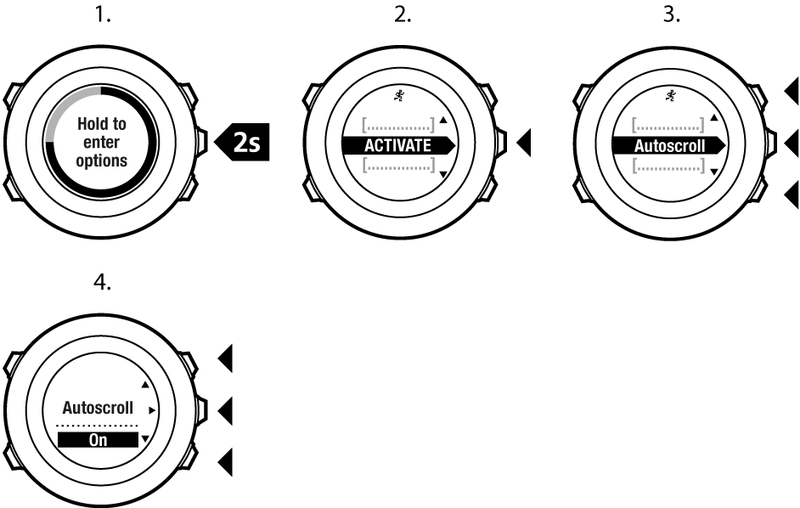 You can transfer up to 10 different sport modes created in Movescount to your Suunto Ambit2 S. Only one sport mode can be active at a time. You can also edit the default sport modes in Movescount. You can set your watch to automatically scroll through your sport mode displays using Autoscroll. Activate the feature and define how long the displays are shown on your custom sport mode in Movescount. You can turn Autoscroll on or off during exercise without any effect on your Movescount settings. Scroll to Autoscroll with Start Stop and select with Next. Press Start Stop or Light Lock to set AutoscrollOn/Off and accept with Next.